The exhibition is focused on still life. The exhibition “Still Life” features paintings, graphics, sculpture, and decorative art. Vernisage: Wednesday, 16. May 2018, 15:00 h.
On May 16, the Kyrgyz National Museum of Fine Arts named after Gapar Aitiev opens the Republican Spring Exhibition of the Union of Artists of the Kyrgyz Republic – an exhibition of graphics, painting, and decorative art. The theme of the exhibition is still life. Still life in the fine arts of Kyrgyzstan has deep traditions. Suffice it to recall the works of such masters as: Dil-Furuz Ignatieva, Aman Asrankulov, Dzhambul Dzhumabaev, Kadyrzhan Turgunov. 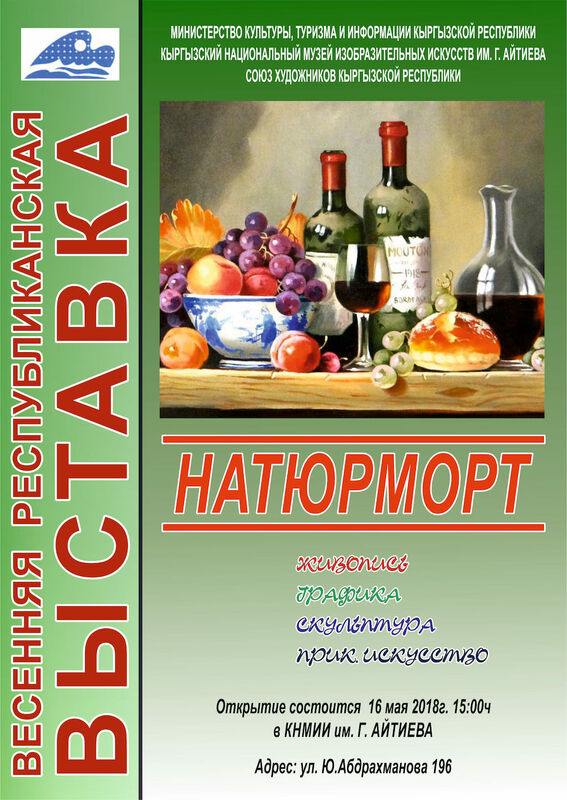 Many famous artists of Kyrgyzstan did not consider the still life as an independent theme, but gave it due attention. Still life, as an important element, is present in many thematic canvases, portraits, landscapes, and thus enriches the idea of ​​the work, complements the general coloring of the picture, enhances the overall impression of the work of art. This important role of the “small” genre can be found in the works of Semyon Chuikov, Gapar Aitiev, David Flekman, Lydia Ilyina, Feodor Stukoshin and many other outstanding masters of the Kyrgyz fine arts. The exhibition “Still Life” shows that in the independent Kyrgyzstan these traditions have been preserved and are successfully developing! Artists of the Republic constantly turn to this difficult genre for the search for skill and inspiration. At the exhibition works of a realistic direction are widely presented. Still life, in this case, become an occasion to admire the beauty of real objects, will share with the viewer an impression of nature, emotions and interpretation. Interesting works were exhibited by such artists as Orozmatov Kadyrkul, Korotkov Nikolai, Korotkova Zinaida, Kopelovich Natalia, Musayev Bakyt, Esenkanov Zalkar, Satarkulov Sydybek and many others. Often a still life becomes an occasion for bold formal experiments; the result of an original vision, a bright creative credo, philosophical reasoning. An unusual form attracts attention at the exhibition works of artists such as: Bayterekov Adyl, Zhakypov Zhylkichi, Kurinskikh Petr, Saliev Erkin, Shygaev Yuristanbek, Fapizyev Vladimir, Shkurpela Konstantin, and many others. Artists from the regions of Kyrgyzstan are widely represented at the Republican show, these are traditionally strong works that enrich the overall impression. Many interesting finds in the field of arts and crafts. Many works by young artists who work in the vein of realistic traditions and creative searches. This is the first big exhibition after the 19th Congress of the Union of Artists, at which important organizational decisions were made. The new Board was invited to intensify the work of the Youth Association of the Union of Artists. There were complaints at the congress about the quality of the union exhibitions, opinions were expressed on the need to take the selection of works more seriously. Still life is traditionally a small canvas and the best-selling genre. And many works are exported abroad. On the one hand, this shows a tremendous interest in our fine arts, and on the other hand, the unique works of our culture become unattainable for the republican spectators. This issue is not difficult to solve: the state has the financial ability to make purchases of the most interesting works, replenishing the national collection of fine arts. Despite the difficulties, the reporting exhibitions of the Union of Artists remain a stronghold of professionalism and traditions, amaze with a powerful creative potential. The exhibition “Still Life” awaits on May 16 literate, interested, benevolent spectators.